As always, its really nice to find your work in print, but this find has put together a couple of my favourite hobbies. I’m not actually a CAMRA member but I am a Real Ale drinker and Home Brewer, couple this with my interests in photography and design. 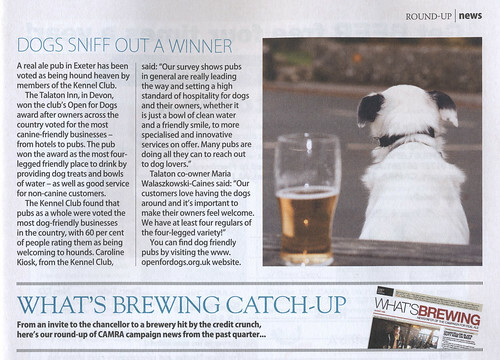 The CAMRA ‘Beer’ magazine was passed onto me by one of the guys at work and I’d already flicked through it once and missed finding this shot of Spook the dog and a pint of beer, the shot has been downloaded 24 times at iStock and a handful of times at other stock sites. It makes it better for my photography to be displayed in the well designed magazine that ‘Beer’ is, my compliments to the designer for a clean and tactile feeling read, the use of paper stock compliments the look nicely. 2 Responses to "Dog, Beer CAMRA… Sale!" Awesome! Love it when a shot comes together!